Deliberately placing each foot in front of the other, Greg waits between steps and breathes in and out. Mountaineering is not a terribly fast paced activity. On really hard climbs, where the atmosphere is thinner, he spends quite a bit of time focusing on his breathing. The walking is actually quite simple. It’s the other parts, like intentionally zoning in breathing correctly, that can slow you down. The first time Greg attempted mountaineering, he set the lofty goal of climbing Mt. Cotopaxi outside of Quito, Ecuador. At 19,374 feet, it’s a decent sized volcanic mountain, and a fairly hefty mountaineering goal. He has been an avid hiker and backpacker for many years, but was ready for something much larger, a goal that would challenge and inspire him: Mt. 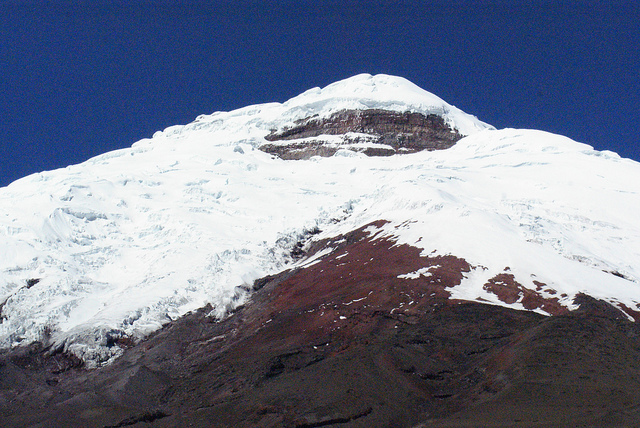 Cotopaxi. Climbing a mountain can fill you with such joy and a great sense of accomplishment. The energy and effort required to summit a mountain, or to “bag a peak,” is unreal. Yet, greater still is the reward, the rush of endorphins, and the sense that you did something super challenging. No matter how big or small, whether it’s a 6000 foot goal, or a 19,000 foot goal, getting to the top of a mountain means being rewarded with the large vista spanning before your eyes. In mountaineering, there are tons of things to consider. In the Dreaming of Everest post, we reflected on the collaborative role the Sherpa plays in helping people to reach their goals. Likewise, on this trail, Greg contracted a professional company and guide to help him plan and complete his ascent in the most efficient way possible. So, with a guide, equipment, and a clear path, he set out to conquer the mountain in the early morning darkness. At Radar, we have been in both Greg’s shoes and the guide-company’s shoes. We know what it means to scale a “creative mountain” with the help of strategic partners, and there are some mountains that we know like the back of our hand, and we gladly lead our clients up those craggy cliffs. We’re in it for the adventure, together. This post is the ninth of a multi-part blog series, “The Camping Creative,” tying together the tent-pegs of camping and creativity. Read the first post here.